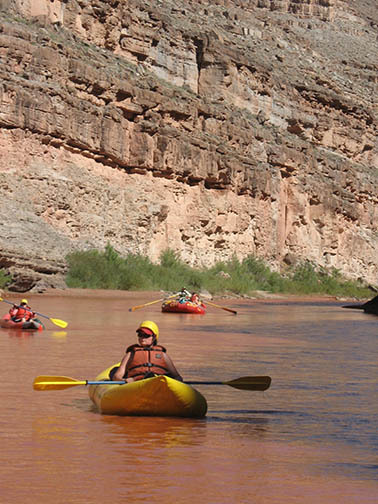 Plan a private Colorado River river overnight trip for your family or group! 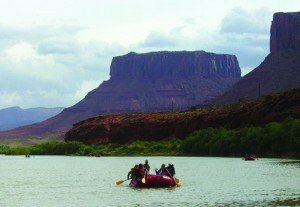 This private Colorado River Overnight Family Float Trip with CFI through the scenic Fisher Towers and Professor Valley section near Moab, UT. Join us with your family or friends! We begin with your group at the historic Dewey Bridge and end the next afternoon at the BLM boat ramp after a day of scenic floating and river fun, sumptuous dinner and camping under the stars, and a final day of gentle to exciting whitewater. The Colorado River begins high in the Rocky Mountains. As it flows down the western slope of the Continental Divide it joins the Gunnison River at Grand Junction, CO. Soon the Colorado slows and begins to take on the character of a desert river. By the time the Colorado reaches Professor Valley it is entrenched in deepening canyons of warm pink, red, and ochre sandstone. The river often carries rich loads of sediment hiding the array of fascinating aquatic life just below the surface. of whitewater). We use a variety of boats (paddle rafts, oar rowed rafts, and inflatable kayaks) depending on the season and the water levels, which can range from 2,000 cubic feet per second (cf/s) to over 50,000cf/s. We begin at the Dewey Bridge Campground and boat launch. The river flows through open country, and the banks are lined with cottonwood trees and other riparian vegetation, home to many birds. We may see one of the few nesting pairs of Bald Eagles in the state of Utah. Wildlife sightings may include Great Blue Herons, Mule Deer, Bighorn Sheep, and Beaver. Floating into Professor Valley we see the world famous vista of Fisher Towers set against the snow capped La Sal Mountains. Soon, we encounter several mild rapids, providing splashes and short thrills, especially in May and June during the spring run off. We pass the old homestead site of an early 20th-century mail carrier at Hittle Bottom. The river corridor lands are public lands, managed by the Bureau of Land Management, the National Park Service, and the State of Utah. Like all CFI trips, this trip will be led by CFI guide/naturalists who holds wilderness emergency medical and CPR training. 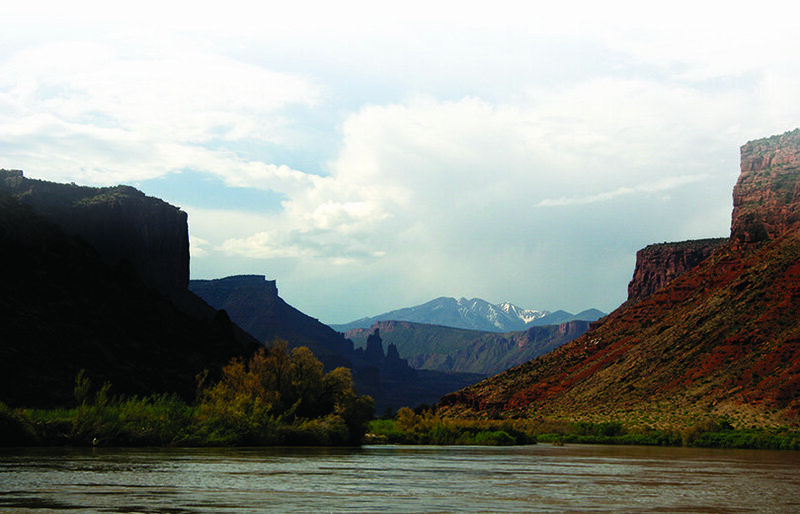 CFI guides are highly knowledgeable about the Colorado Plateau. They are inspiring and creative teachers, experienced in working with both children and adults and added benefit, they are wonderful cooks! As we move along the river, CFI staff will offer activities focusing on the local geology, ecology, cultural and natural history of this region. Arrive at the Dewey Bridge Boat Ramp (GPS Coordinates: 38.810871, -109.307643) at 10:30 a.m..
Takeout at BLM boat ramp (GPS Coordinates: 38.661681, -109.500145) by 4:00 p.m.